(1) INSTRUCTOR: We teach the skills (technique) of the sport and how to apply those skills in the bout against an opponent (tactics) in teaching lessons. (2) TRAINER: We train athletes to optimize technique and tactics in the bout through tactical options and bouting lessons. We use current forms of physical training and conditioning to ensure the athlete reaches his or her physical peak at the correct times for competition. (3) COACH: We plan the strategy of the fencers season to ensure their continued development, scout opponents, ensure that our teaching and training is up to date for the opponents they will fence, prepare athletes mentally and physically in the days prior to competition, provide strip coaching during competition, and reintegrate the fencer into the normal training sequence after competition. Everyone who provides instruction at Salle Green is either a certified and internationally recognized professional or is in training for certification under the supervision of Maitre Green. All are members of the United States Fencing Coaches Association, the Intrenational Fencing Coaches Association, and/or the Classical Academy of Arms, and Coach Members of USA Fencing. We support the United States Olympic Committee and USA Fencing’s SafeSport youth protection program, and we require all Trainers to complete SafeSport training. All trainers are required to abide by the United States Olympic Committee’s Coaching Code of Ethics. We identify youth fencers with the aptitude for coaching at age 13 or later, provide them professional training through United States Fencing Coaches Association National Training Program and Classical Academy of Arms clinics, and support them in obtaining professional credentials. This is an important part of our overall youth development program, increasing their knowledge of the sport, building a new skill set, and providing them real, adult, leadership opportunities within the Salle. The four levels of professionals recognized by the United States Fencing Coaches Association and internationally by the Academie d’Armes Internationale are as listed below. At each level the individual may be certified d’Armes as having passed the practical and written test in foil, sabre, and epee, or be certified in a single or two weapons. The equivalency of each rank to the International Framework for Sports Coaching, adopted by the Association of Summer Olympic International Federations, is noted in parentheses. 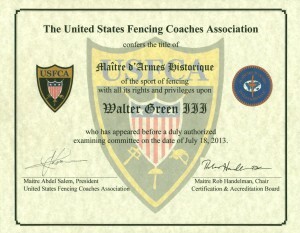 Individuals professionally certified by the United States Fencing Coaches Association, the Academie d’Armes Internationale and its other national member academies, the International Fencing Coaches Association, or the Classical Academy of Arms have passed written examinations that demonstrate the breadth of their knowledge about fencing and practical examinations in front of a panel of experienced senior professionals that show their skill in teaching technique and tactics. We include our members’ certificates on this site so that you can be assured that you, or your child, will receive quality instruction from a trainer dedicated to doing that task to a professional standard. 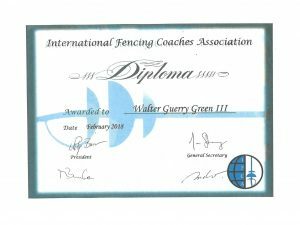 Professional certification: Diploma of the International Fencing Coaches Association and Maitre d’Armes (2018). 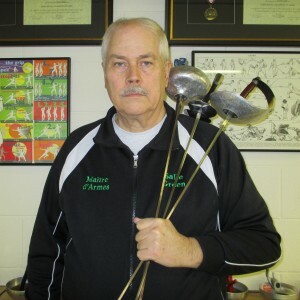 Maitre d’Armes (3 weapon Fencing Master) (Academie d’Armes Internationale 2005 and graduate of the AAI Master’s course at Bad Kharlshafen, Germany) and Maitre d’Armes Historique (Historical Fencing Master) (United States Fencing Coaches Association 2013). Previously certified as Prevot d’Armes (3 weapon Prevot) in 2005 and Moniteur d’Armes (3 weapon Moniteur) in 2004 by the USFCA. 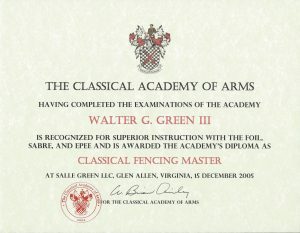 Credentialed as a Classical Fencing Master (Classical Academy of Arms 2005) and Classical Fencing Master Trainer (Classical academy of Arms 2016). 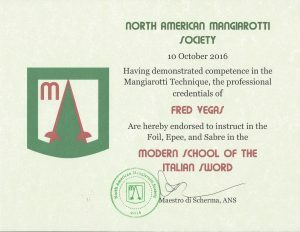 Endorsed by the North American Mangiarotti Society to teach the Modern School of the Italian Sword in Foil, Epee, and Sabre (2016). Started fencing: 1965 Duke University. Studied under: Maestro Giorgio Santelli (USFCA), Maitre d’Armes Raoul Sudre (USFCA), Prevot Ron Cullum (British Academy of Fencing), Maitre d’Armes Vinnie Bradford (USFCA), Maitre d’Armes Arnold Mercado (USFCA), Fechtmeister Mike Bunke (Akademie der Fechtkunst Deutchlands), Maestro di Scherma Stuart Kaufman (Accademia Nazionale di Scherma). Competitive background: 1966 Varsity letter in Fencing at Duke University, 1974 and 1975 Virginia Division Points Champion, 1976-1979 fenced for Cambridgeshire county in England earning County Colors, C in Sabre and E in Foil and Epee at end of competitive career in 1980. Service to fencing: Virginia Division Chair, Amateur Fencers League of America (now USA Fencing) 1973-1975, Mid-Atlantic Section Chair, Amateur Fencers League of America 1975-1976; Treasurer, United States Fencing Coaches Association 2007-2010; Chair of the Club Committee USFCA 2007 to date; 1973-1976 Referee 1 in Epee (National Championship level) and 2 in Foil and Sabre (Sectional Championship level); current Head Examiner for professional examinations for the United States Fencing Coaches Association; past member of the Certification and Accreditation Board of the USFCA. Publications: Author of seven fencing texts published by Lulu.com: The Assistant Moniteur Handbook; The Moniteur Handbook; The Moniteur d’Escrime Historique Handbook; Teaching Notes for the Classical Fencing Instructor; The Private School of Defense: The Rapier Method of G. H. 1614 CE; Broadsword, Sabre, and Cutlass in the 1800s: A study of six sources; and Fencing Technique and Tactics: The Salle Green Blog. 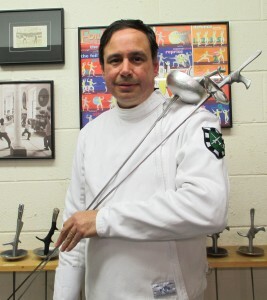 Author of the 12 teaching guides for the United States Fencing Coaches Association’s National Training Program. 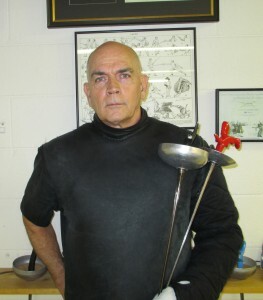 Author of 151 articles on modern, classical, and historical fencing published on EzineArticles.com. Education: Bachelor of Arts, Duke University 1969, Master of Public Administration, University of West Florida 1983, Master of Business Administration in Aviation, Embry Riddle Aeronautical University 1987, Doctor of Philosophy, Capella University 1999. 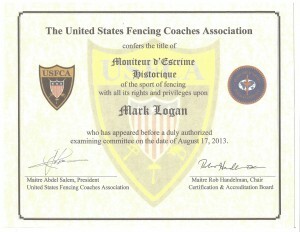 Coaching philosophy: I am an athlete centered Fencing Master. I work to meet the goals of the individuals who come to fence at Salle Green, whether their focus is competitive or recreational, while instilling in them the values of honor, respect, and sportsmanship central to the history and future of our sport. This includes teaching our classical fencers with fidelity to classical technique, and providing the highest standard of tactical and technical training to our modern athletes based on current developments in fencing and in sports science. I work to create and maintain a Salle culture of hard work and dedication to the sport to build in all of our athletes the ability to value, understand, and achieve excellence. I value loyalty to the Salle and to its values, and I am fiercely loyal to my students. My vision is that Salle Green will be the premier venue for training fencers and coaches in the Southeast Region. 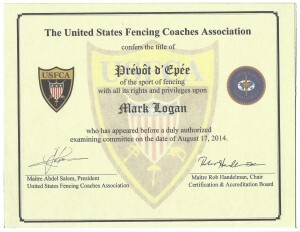 Professional certification: Prevot d’Epee (Epee Prevot) (United States Fencing Coaches Association 2014), Moniteur de Fleuret (Foil Moniteur) (USFCA 2008), Moniteur d’Escrime Historique (Historical Fencing Moniteur) (USFCA 2013). 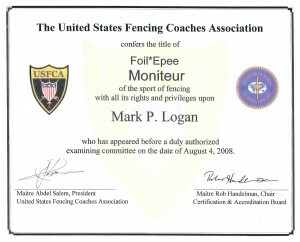 Previously certified as Moniteur d’Epee in 2008 by the USFCA. 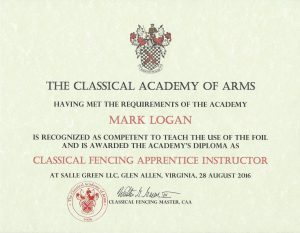 Credentialed as a Classical Fencing Apprentice Instructor (Classical Academy of Arms 2016). Endorsed by the North American Mangiarotti Society to teach the Modern School of the Italian Sword in Foil, Epee, and Sabre (2016). Started fencing: 1972 Virginia Commonwealth University. 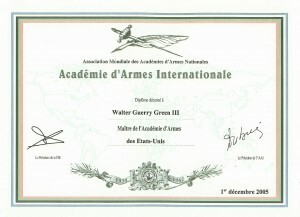 Studied under: Maitre d’Armes Wes Glon (USFCA), Maitre d’Armes Walter Green (USFCA), Maestro di Scherma Stuart Kaufman (Accademia Nazionale di Scherma). Competitive background: competitor in Veterans Epee, D 2015 in Epee. Service to Fencing: founder of Amelia Steel fencing club in Amelia, Virginia, and coach at Chester Knights Fencing Club in Chester, Virginia. Education: Bachelor of Fine Arts, Virginia Commonwealth University. Professional certification: Assistant Moniteur de Fleuret (United States Fencing Coaches Association 2013). Credentialed as a Classical Fencing Demonstrator (Classical Academy of Arms 2016). Endorsed by the North American Mangiarotti Society to teach the Modern School of the Italian Sword in Foil, Epee, and Sabre (2016). Started fencing: 1977 High School Nuestra Senora del Rosario; fenced at the Venezuelan Naval Academy. Coaching philosophy: I enjoy making instructional time for Beginner and Intermediate students fast and fun.